As a National Trust Ranger I help to look after 5 ½ miles of the Lake Windermere lakeshore, we have a couple of islands that we also help to manage. 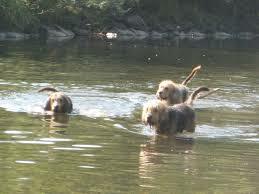 I spend a good deal of my time by the water, in the woodlands and farmland close to the lake. It has been a source of continuing frustration that I have never seen an otter in the wild in the lakes…. until recently ! Otters have been a spectacular part of the Lake District wildlife for thousands of years , they are a carnivorous mammal feeding mainly on fish , part of the weasel family. The name is derived from the Old English word ‘otor’ which in turn is derived from the older word ‘wodr’ which is where the word ‘water’ comes from ( see the connection ! ) they can be seen in the water or close to it even in the middle of the day. The Otter population in the Lake District has dramatically reduced in size over the years , suffering as a result of hunting in the 1800’s, packs of specially bred Otter Hounds were used to track down and kill Otters along water courses . 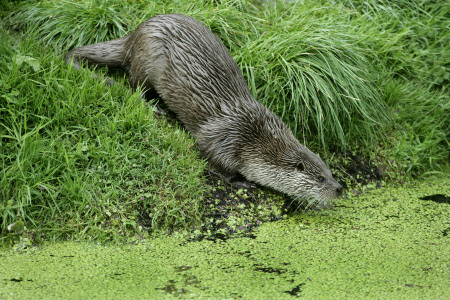 Otters had made themselves unpopular with land owners who were keen to protect their fish stocks. Numbers dropped dramatically in the 50’s and 60’s as a result of water pollution and a loss of habitat until they could only be found in small numbers in North Lancashire and South Cumbria. But in the last 20 years the otter population has been recovering and sightings have been increasing around Windermere, Coniston and Tarn Hows. I would hear news of otters spotted at Tarn Hows, Wray Castle and Low Wray , but frustratingly never see them when I was there ! The tell tale sign of an otter in the water is seeing the dark shape of the head moving smoothly and rapidly , low in the water then disappearing below the surface with a flick of the tail. Sometimes I would see this sight only to find out that it was a cormorant or a coot. My luck changed un-expectantly a couple of weekends back when I was waiting for the car ferry that crosses Windermere on a Saturday morning at about 10.00am. Sat in the car looking out across the lake I noticed the head swimming past, I jumped out of the car and ran down to the waters edge and there a few metres away was a young otter hunting for fish , apparently unaware , certainly not bothered that there were quite a few boats and people around ! It was one of those thrilling , magical wildlife moments, made all the more sweet because I had to wait so long for it . So here’s another reason ( as if you needed one ! ) why you might want to take a stroll along the west shore of Lake Windermere, combine your otter spotting with a visit to Claife Viewing Station or Wray Castle. If you fancy a longer stay next to the lake, why not stop at our Low Wray Campsite or one of our cottages at High and Low Strawberry Gardens. Finally, if you find yourself in a bad mood , having a bad day , worried about Brexit, or our chances in the Eurovision Song Contest , check out the pictures online of ‘otters holding hands’ and feel the stress melt away. Assistant Ranger, Julie talks about a master builder of tree holes within our woodlands – the Great spotted woodpecker! It certainly earns its name, for it spends nearly all of its life pecking at tree trunks. But did you know they are also housing developers, providing future homes for many woodland animals. If you have visited Tarn Hows recently, you may have noticed our bird feeding station, and its myriad of visiting birds. As a child of about 8 or 9, I used to love watching the ‘back birds’ in my Nana and Grandad’s back garden, and my mum reminded me of the time I took it upon myself to buy them a coconut shell bird feeder for Christmas, using my own pocket money. And so, fast forward a few years, I now enjoy seeing the birds in my work back yard, at Tarn Hows, when I pass through each week. 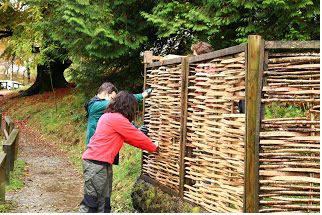 In November, I was lucky enough to be there for the installation of new hazel hurdles for the feeding station (built by our Academy Ranger, Ted; Volunteer, Adam and Intern, Dale). In the last few weeks, I arrived at work to find a note from my colleague, Ian, asking that I please top-up the feeders in his absence. I was more than happy to do so, especially given the pleasure I have in looking out for my favourite visitor, the Great spotted woodpecker. On my days off, I love walking through woodlands, and often stop and listen to see what I can detect around me. On a still day, the clamour of animal life carries far, including, if you are lucky, the unmistakable drumming sound of a Great spotted woodpecker, echoing through the trees. I adopted a full-on stalker mode strategy a few years back in order to spot one close-up, and managed to creep slowly but surely to where the sound emanated from, and was privileged to watch the woodpecker drumming away high up in the canopy. Many birds and mammals nest, hide and take shelter in tree holes. 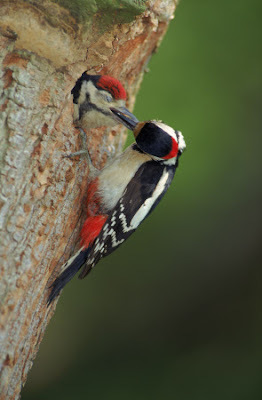 However, only one kind can hammer a home out of wood; only it can excavate a hollow from a solid wood trunk with its chisel-like bill, as a secure place to raise its brood – the Great Spotted Woodpecker! It has special feet (see below) to help them grip the bark, and a stiff tail to help them keep steady as they hammer away. woodpeckers have different feet from other birds – with two toes pointing forwards and two pointing back? This helps them cling to tree trunks. The male and female birds both work on making their nest hole high up in the tree trunk – usually at least 3 metres above the ground. After all this hard work is finished, the female lays up to 8 shiny white eggs inside the hole in the tree. The parents then take it in turns to sit on the eggs to keep them warm, and whoever’s not sitting on the eggs goes off to find food. Some weeks later the eggs hatch, and once this happens the mother and father woodpeckers have to spend all their time collecting insects for the hungry youngsters to eat. Finally, though, the young woodpeckers leave their hollowed-out home and fly off to make holes of their own. Check out BBC Springwatch footage here of fledging woodpeckers leaving a nesthole. Nuthatches – who narrow the hole entrance by plastering with mud. Stoats – an remarkable addition to this list, they can raise their families surprisingly high up a tree! Grey squirrel - they will gnaw at the hole to enlarge it. The Great Spotted Woodpecker probes tree trunks for insects and larvae. They have extremely sticky tongues enabling them to extract the insects from their nests. In winter months, when their insect food is scarce, their diet is supplemented by nuts and berries and they will visit garden peanut feeders. 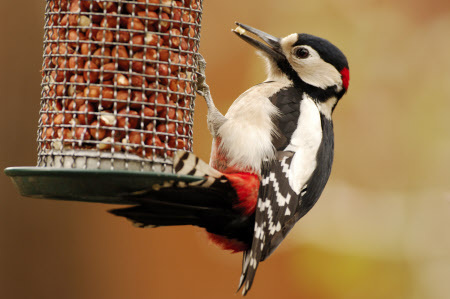 So next time you are visiting Tarn Hows, look out for the Great spotted woodpecker at the bird feeding station. Listen out for them in our South Lakes woodlands and if you visit Wray Castle, make sure you explore along the lakeshore. If you’re quiet and listen out, you may hear one. If you’re lucky, you may see one – I’ve spotted one down near the pier whilst working there.